Asian buffalo, Bubalus, a genus that includes the domesticated water buffalo. It is also sometimes used to refer to the American bison, Bison bison. All of these are even-toed ungulates (hoofed mammals). They are all ruminants, which means that they have complex digestive systems that allow them to live on a diet of grass, leaves, and other low-grade plant material, utilizing symbiotic microorganisms to break down cellulose, while providing shelter and food for the microbes. All buffalo belong to the subfamily Bovinae, along with domestic cattle, Bos taurus. The domesticated water buffalo, a type of Asian buffalo, provides great value to humans, including pulling carts, pulling plows to prepare rice fields, and providing milk, meat, and leather, and fertilizer. In India, more milk is produced from water buffalo than from cattle. Unlike the African buffalo, which has not been domesticated and can be dangerous to humans, the water buffalo have been known to be docile and form bonds with their human owners. The African buffalo or Cape buffalo (Syncerus caffer) is a large animal, 1 to 1.7 meters (3 to 5.5 feet) high at the shoulder, 2 to 3 meters (7 to 10 feet) long, and with a weight of 500 to 1000 kilograms (1,100 to 2,200 lbs). Males are somewhat larger than females. 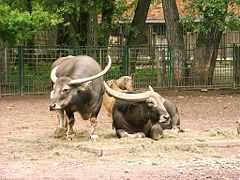 Both sexes have large horns. Newborn African buffalo are covered with thick reddish hair, which becomes sparser and darker with age so that mature animals are dark brown or black (Nowak 1983). African buffalo are found over much of Africa south of the Sahara Desert, in habitats ranging from open savanna (grassland with some trees) to thick forests. Those living in forests tend to be smaller than those living on the savannas. Some of the nations in which African buffalo are now found are Ethiopia, Somalia, Zambia, Zimbabwe, Namibia, Botswana, Mozambique, South Africa, Kenya, and Tanzania. 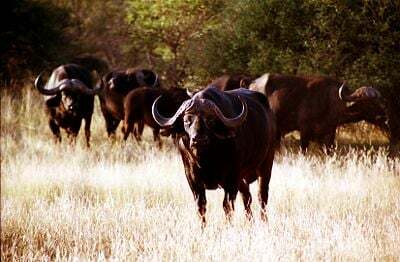 African buffalo tend to live in herds, although some older males live alone. Forest living buffalo herds most commonly contain around a dozen animals; while on the savannas herds are mostly in the range of 50 to 500, with groups of up to 2,000 or 3,000 sometimes coming together in good grazing conditions (Huffman 2006). African buffalo are formidable fighters. Both males and females will attack and kill lions and other predators using both their horns and hooves. Many human hunters have also been killed by them. Because of this, sports hunters consider them one of the "Big Five" African animals most dangerous and challenging to hunt. The others are elephants, lions, rhinoceroses, and leopards. Although in the past the population of African buffalo was in the tens of millions, it now stands at about 900,000; mostly in the savannas of eastern Africa. Some of the reasons for this decline in numbers are hunting, both for food and for sport; the conversion of their habitat to farmland and cattle pasture; droughts; and the introduction of foreign pests and diseases, especially the cattle disease rinderpest. It is not considered to be in danger of extinction as long as it remains protected in parks and reserves, although habitat loss continues (Huffman 2006; IUCN 2006). The African buffalo has never been successfully domesticated. The wild water buffalo, sometimes called the Arni, Bubalus bulbalis, is somewhat larger than the African buffalo. An adult male typically stands 1.5 to 1.9 meters (5 to 6.25 feet) tall at the shoulder and weighs 700 to 1200 kg (1,500 to 2,600 lbs), while females are smaller. The spread of their horns is the largest of any living ungulate. They are covered with sparse hair and range in color from light gray to black. Their skin is very thick, which helps to protect them from insects and from thorns (Nowak 1983). The wild water buffalo is native to the area of India and Southeast Asia, and has been domesticated. Wild water buffalo prefer to live near freshwater and mostly live in marshland and along the banks of rivers. They are good swimmers and spend much of their time in the water, which keeps them cool and protects them from biting insects. They can graze on water plants while swimming and even dive underwater to feed on them (Massicot 2004). Their feet are large and the toes can spread apart to give them better footing in mud. Wild water buffalo are now very rare. It is thought that less than 4,000 remain and their numbers are declining. Some of the problems are illegal hunting, loss of habitat, introduced diseases and parasites, and interbreeding with domesticated buffalo (IUCN 2006). More than half the people of the world depend on rice for their staple diet and it is the water buffalo that enables rice to be cultivated and threshed with the greatest efficiency and economy. Water buffalo changed under domestication. Over many generations they became smaller so that today their average weight is around 300 to 600 kg (650 to 1,300 lbs). Their bodies became rounder and their horns smaller. They also became slower and more docile. Water buffalo form a bond with their human owners and can be herded even by children. There are even stories of water buffalo protecting their masters by fending off attacks by crocodiles and tigers (Olson 2006). Like cattle, domestic water buffalo have many uses. They have been used to pull carts and carry loads, although they travel more slowly than oxen, donkeys, and horses and need to stop and get into water to cool off on hot days. They have provided milk and meat for food and leather, bone, and horn for materials. Their manure is used to fertilize the rice fields and is used for fuel. Over the years, domestic water buffaloes spread around the world to areas to which they were suited, mainly lowlands in tropical and subtropical areas with wet climates, especially rice growing areas. By 4,500 years ago, they were found in India and around the year 600 they were introduced to Egypt and southern Europe. In more recent times, they have become common in the Philippines and other Pacific islands and in South America, especially Brazil. In the early 1800s, they were introduced to Australia where many escaped or were abandoned and gave rise to a large feral population in the northern part of the country. There are two main types of domestic water buffalo, the swamp buffalo type originally from East Asia and the river buffalo type from India. Swamp buffalo have straighter, more swept back horns than river buffalo, more like wild water buffalo, and they prefer to wallow in mud, while river buffalo prefer clear running water (as their names suggest). 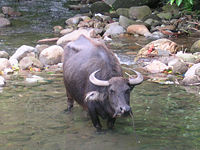 River buffalo are used more for milk production than for work. Buffalo milk is richer than cow's milk and is traditionally used in Italy to make mozzarella cheese. In traditional societies, water buffalo were not killed for meat unless they were unable to work because of age or injury. In these cases, the meat was tough and not very palatable; however, when buffalo are raised expressly for meat, the product compares with that of cattle. Water buffalo leather is very thick and strong and is used to make, among other things, shoes and motorcycle helmets (Olson 2006). In 1992, the United Nations Food and Agriculture Organization (FAO) estimated the world water buffalo population at 148 million. About 95 percent live in Asia, with India and China having the largest number. In India, more milk for human consumption is produced by water buffalo than by cattle. In Thailand, the Philippines, and Malaysia, the number of water buffalo seems to be decreasing, while in most other southeastern Asian countries it is increasing. In the United States, except for Hawaii, water buffalo have only recently been introduced as farm animals and number in the few thousands (Ligda 1996). The tamaraw,' Bubalus mindorensis (also tamarau, tamarao, or Mindoro Dwarf Buffalo) is native to the island of Mindoro in the Philippines. It is believed, however, to have once also thrived on the greater island of Luzon. The tamaraw was originally found all over Mindoro, from sea level up to the mountains, but because of human habitation, hunting, and logging, it is now restricted to only a few remote grassy plains and is now an endangered species. In 2000, its population was estimated to be less than 200 (IUCN 2006). The tamaraw is smaller than other buffalo, about one meter (3 feet) tall at the shoulder and weighing 200 to 300 kg (450 to 650 lbs). They have more hair than water buffalo and are dark brown to grayish black in color. Their horns are swept back and about 35 to 45 cm (14 to 18 inches) long. They tend to live alone, with the exception of mothers and young, rather than in herds. They can be aggressive and have been know to attack humans (Huffman 2006). The tamaraw is considered a national symbol of the Philippines. It symbolizes sturdiness in a small frame, which Filipinos are said to possess. The tamaraw was pictured on the Philippine one peso coin from 1980 to the early 1990s. There are two species of anoa: the mountain anoa (Bubalus quarlesi) and the lowland anoa (Bubalus depressicornis). Both live in undisturbed forest, and are similar in appearance to a deer, weighing 150 to 300 kg (330 to 660 lbs). Because of their small size (the lowland anoa is only 1 meter tall), they are sometimes called pygmy buffalo or miniature water buffalo. Both are found on the island of Sulawesi in Indonesia; the mountain anoa is also found on the nearby island of Butung. They apparently live singly or in pairs, rather than herds, except when the females are about to give birth. One young is born per year. Both species of anoa have been classified as endangered since the 1960s and the population continues to decrease. It is believed unlikely that there are more than 5,000 animals of each species remaining. Reasons for the decline of the anoa include hunting for hide, horns, and meat by the indigenous peoples (though they were rarely hunted by indigenous peoples before the introduction of modern firearms); and loss of habitat due to the advancement of settlement. Currently, hunting is the more serious factor in most areas. The lowland anoa stands one meter (3 feet) tall at the shoulder, and is the smallest of all wild buffalo. The horns of anoa are peculiar for their upright direction and comparative straightness, although they have the same triangular section as in other buffalo. White spots are sometimes present below the eyes, and there may be white markings on the legs and back; and the absence or presence of these white markings may be indicative of distinct races. The horns of the females are very small. The nearest relatives of the anoa appear to be certain extinct buffalo, of which the remains are found in the Siwalik Hills of northern India. International Union for Conservation of Nature and Natural Resources (IUCN). 2006. Syncerus caffer, Bubalus bubalis, Bubalus quarlesi, Bubalus depressicornis, Bubalus mindorensis. Retrieved January 9, 2007. Ligda, D. J. 1996. The Water Buffalo. Retrieved January 9, 2007. Massicot, P. 2004. Wild Asian (Water) Buffalo. Animalinfo.com. Retrieved January 9, 2007. Olson, T. J. 2006. Turkey Creek Water Buffalo. Retrieved January 9, 2007. This page was last modified on 29 August 2008, at 13:25.